The state of New York is well positioned to make a significant impact on the developmental trajectory of the nascent legal industry in a way that strongly favors diversity and inclusion. Furthermore, the history of marijuana prohibition in New York and lessons learned from other states have produced a wealth of information that can be used to preemptively address potential barriers to progress as the state transitions away from the failed experiment of prohibition. Unfortunately, the economic boon produced by the creation of a legal marijuana market in other states has not necessarily translated into opportunities for members of the communities that have been most impacted by prohibition. 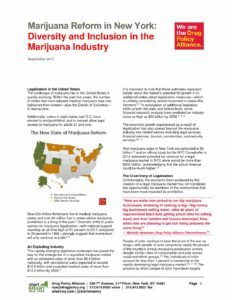 It is vital for New York to center racial and economic justice as we create a new, well-regulated, and inclusive marijuana industry.